Celebrating the flora and fauna of Northern California. Inspired by the Botanical Garden’s divers foliage and inhabitants, EarthStone’s natural colors and textured relief surfaces complement the unique surrounding terrain. The abstract form is embedded with hundreds of cast concrete and high fire ceramic pieces custom designed and individually fabricated by the artist. The sculptures center void enables spectators to see beyond, visually connecting with the rest and sky. EarthStone’s mosaic pattern evoke the melding of weathered leaves, stones, fossils, bark, and creates, creating an immense primordial rock teeming with life. Redding sculptor Colleen Barry specializes in making art that encourages public interaction with visitors who may not frequent traditional art venues, evoking surprise and delight as they encounter the unexpected. “My public art alway has a sense of place, incorporating site specific storytelling elements indigenous to the locale”. Colleen Barry’s art has been enjoyed by a worldwide audience in over two-hundred museum and gallery exhibitions. She holds a Master of Fine Arts degree and has taught at numerous colleges and art institutions. Additional work by this prolific artist can be found at Turtle Bay. Explore the park and see if you can find the shady Mosaic Oasis, the playful Frog Island, and the charming Slow Turtle Crossing. 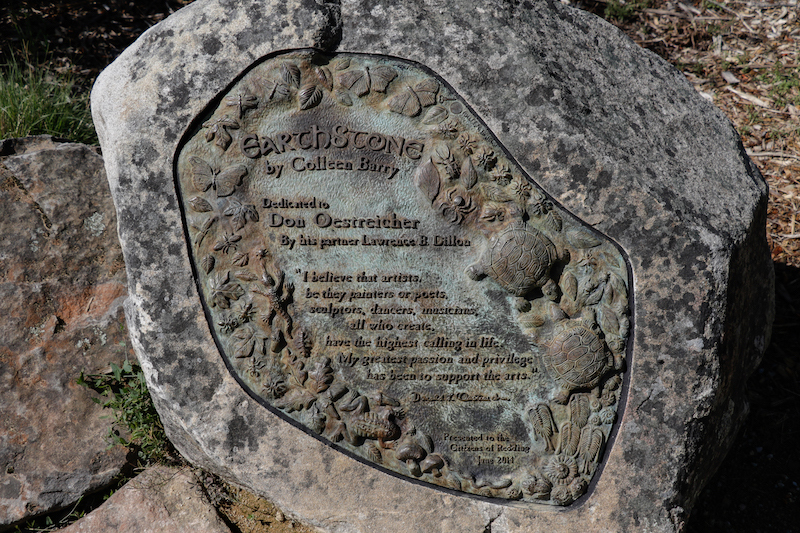 In 2011, Lawrence B. Dillon, commissioned Collin Barry to create EarthStone and dedicated the sculpture to Don Oestreicher, his late partner, as a gift to the community the he and Don loved so dearly. “To me the sculpture manifests the mysteries of nature and life. I believe the Don would love its whimsical appeal to the young at heart”. EarthStone is generously funded by the Lawrence B. Dillion and Donald Oestreicher Trust, Horizons Foundation and the Shasta Regional Community Foundation.